If you don't want the video file of the fight, just watch the replay video. If you're not contended and wanted to play the video again and again, then download the video by following this instruction. 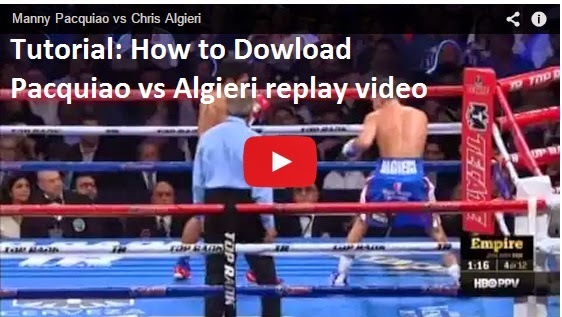 How to Download Pacquiao vs Algieri main event video? 1. Using your web browser ( I prefer Google Chrome for this task), go to http://keepvid.com. 4. Wait for some minutes for the online downloader to process the video. 5. Once done. KeepVid will display video formats ready to be downloaded. 6. Choose the best format that best suit for your device. 7. Right Click then "Save As"
8. Congrats! You've finally downloaded Pacquiao vs Algieri video.